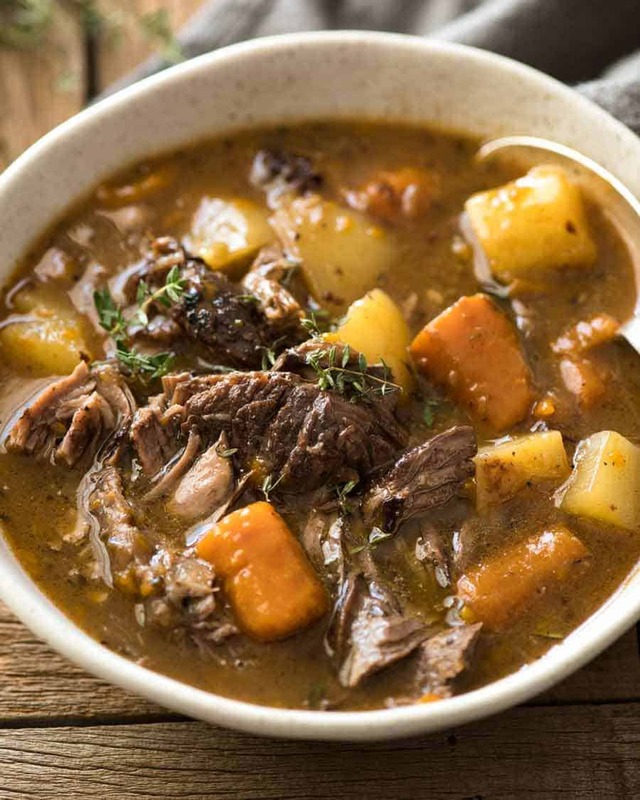 This pot roast recipe was originally published January 2018. Updated September 2018 for housekeeping matters. 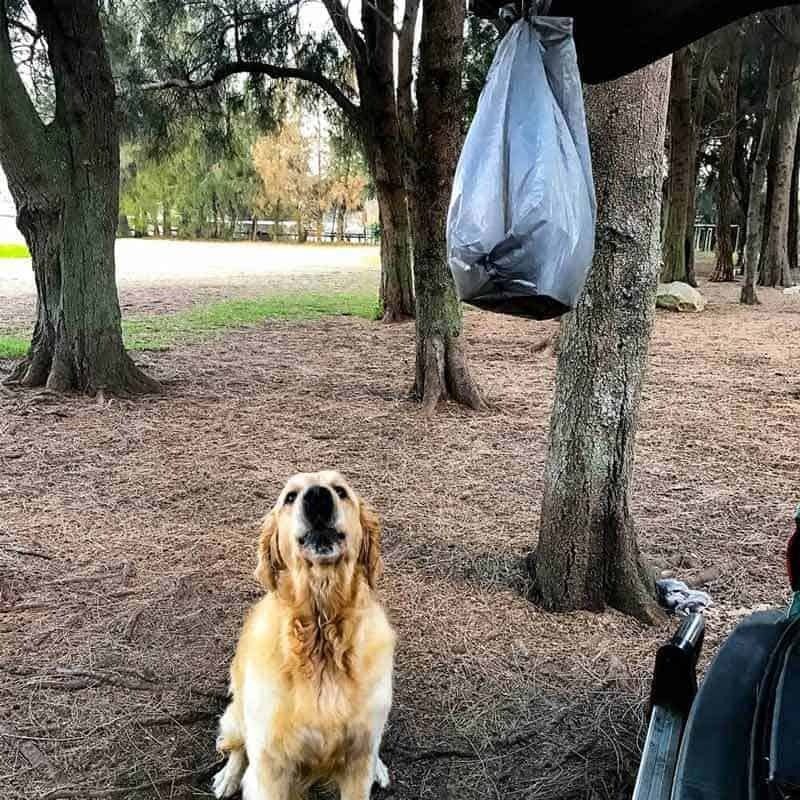 No change to recipe – I wouldn’t dare! 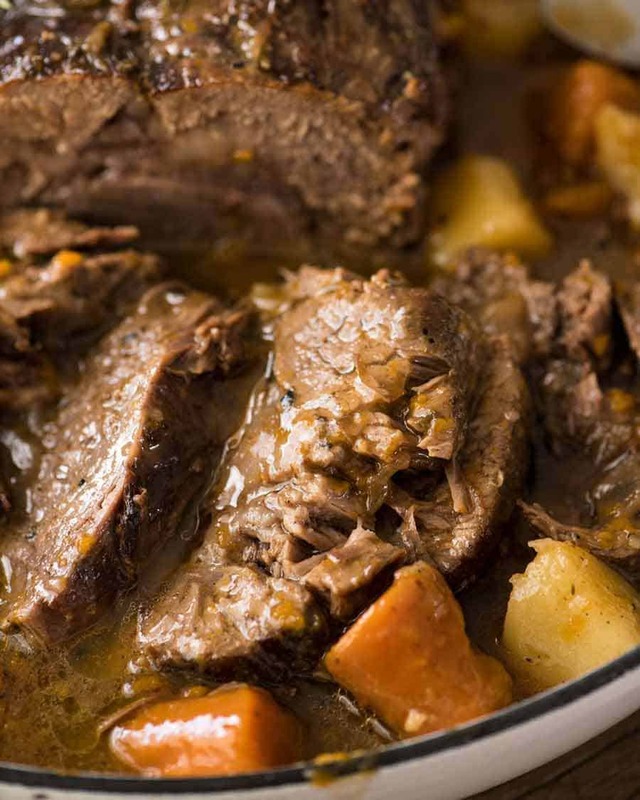 I’m convinced that Beef Chuck Roast was put on this earth to be made into Pot Roast. Is there any better way to transform a good value cut of beef than than to turn it into a fall apart tender roast beef with flavoured loaded vegetables smothered in a gravy? 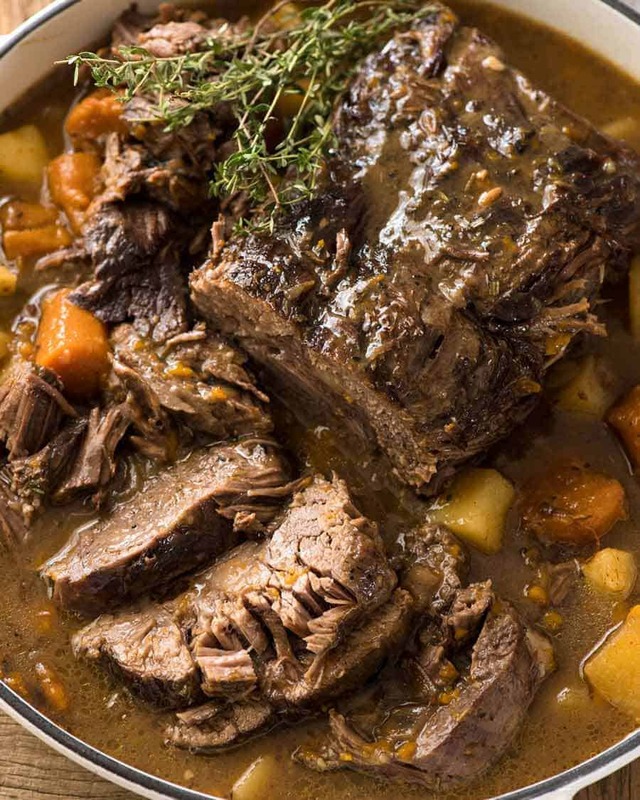 Chuck roast can be purchased in large pieces that aren’t rolled or rolled. 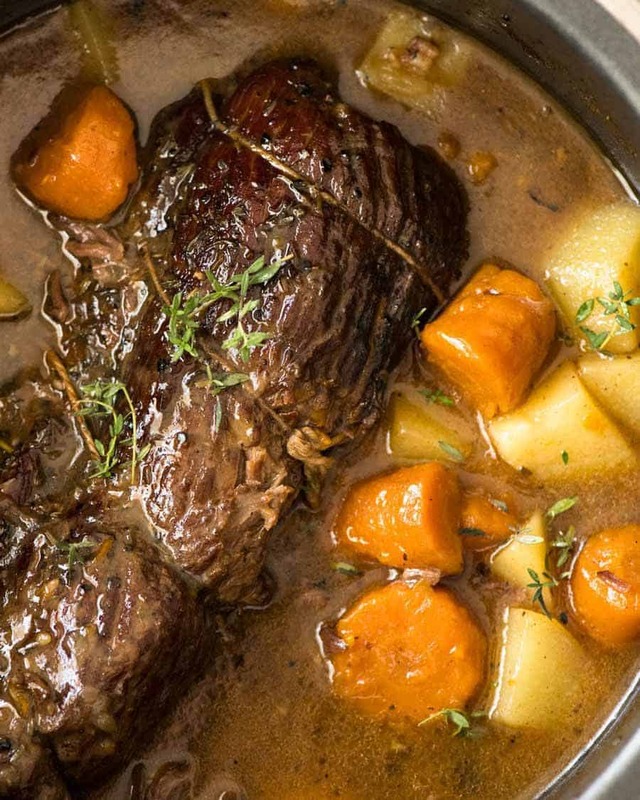 You want to use rolled chuck roast for Pot Roast, otherwise the beef ends up all warped. Supermarkets and butchers should carry chuck roast that’s already rolled, otherwise, you can roll it yourself and tie with kitchen string or ask the butcher to do it for you. Not a bad problem to have, hmm? Recipe VIDEO above. The ultimate one-pot family meal! Meltingly tender slow cooker beef and vegetables smothered in a gravy-like sauce (because I prefer that to just watery broth). I like to make this in my slow cooker but I’ve also added directions for pressure cooker, stove and oven. Heat oil in a skillet over high heat. Brown aggressively all over – a deep dark brown crust is essential for flavour base! Should take about 7 minutes. 1. Beef chuck is a slow cooking cut of beef. It sometimes comes rolled and tied with string (like pictured in mine) – this is when the chuck is thinner. But it also comes much thicker, shaped like a normal roast cut, and this cut isn’t required to be rolled and tied like mine. Both work great for this recipe. 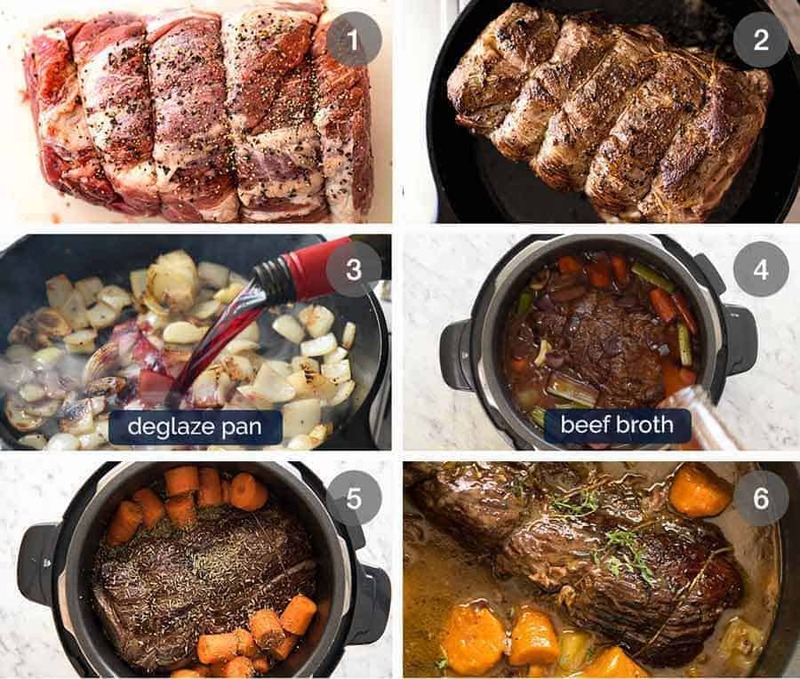 The recipe has a wide range for the beef weight because this recipe makes so much sauce irrespective of beef size, because you need a certain amount of liquid to partially submerge the beef. The cook time remains the same because it’s driven by beef thickness, rather than weight. Feel free to reduce / increase vegetables to your beef size, and also add other vegetables. OTHER BEEF CUTS: This works great with brisket too. Blade Roast will also work but note that the beef is very lean so while it will be tender like chuck, it’s not as juicy inside (which you can disguise by smothering with sauce). 2a. Smashed Garlic – just use the side of your knife and smash it using the palm of your hand. The garlic will burst open but remain mostly in one piece. 2b. Cornflour / cornstarch gluten free alternative: Mix 1 tbsp cornstarch / cornflour with a splash of broth, mix then pour in per recipe, in place of flour. Once beef is cooked and removed, check liquid thickness. If you want it thicker, mix 1 tsp cornflour with splash of water and add, heat liquid (residual heat may be sufficient) and it will thicken, repeat if you want thicker. Best to do it this way because cornflour thickening power is stronger than flour and the amount of liquid that comes out of beef differs. So start with less, then add more later – cornflour doesn’t need cooking out like flour, as soon as it is added and liquid thickens, it can be consumed. 3a. OVEN: Lid on dutch oven or similar, 300F/150C for about 2 hrs (1 – 1.5kg / 2 – 3 lb) or 3 hours (2kg / 4 lb), then add potatoes then a further 1 hour until meat is tender. STOVE: Add 2 more cups of water, simmer covered 2 – 2.5 hrs until meat is starting to be tender, turning meat once or twice. Add potatoes then cook another 30 minutes until meat is super tender and potatoes are soft. Keep an eye on water level. 3b. I add potatoes later otherwise I find they are so soft, they basically disintegrate. If you prefer to add potatoes in at the beginning so you don’t have to worry about adding them later, use red potatoes because they hold up better to the long cook time. 4. The carrots and celery are VERY soft by the end. It’s unfortunate, but a necessary sacrifice because having them in the broth for the whole cook time adds great flavour to the sauce. 5. 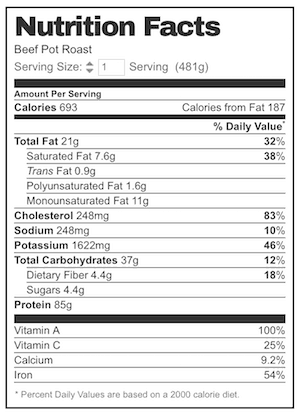 Servings: I allow for 200 – 250g / 6.5 – 8oz uncooked beef per serving which shrinks with the long cook time. The beef pictured was a 2 kg / 4 lb rolled chuck. Recipe originally published January 2018, updated September 2018 for housekeeping matters. No change to recipe – I wouldn’t dare! 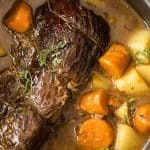 The post Slow Cooker Pot Roast appeared first on RecipeTin Eats.